The Common Core State Standards Initiative states, "Foundational skills are not an end in and of themselves; rather, they are necessary and important components of an effective, comprehensive reading program designed to develop proficient readers with the capacity to comprehend texts across a range of types and disciplines." I am devoted to helping teachers understand how to teach comprehension by supporting you with this site, LikeToRead. 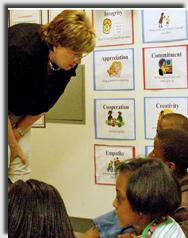 The lessons I share are primarily for students who have the foundational skills but do not understand what they read. All lessons are based on the work of David Pearson, Ellin Keene, Susan Zimmermann, Chris Tovani, Debbie Miller, Stephanie Harvey, Harvey Daniels and other leading educators. Published works by leading companies such as Heinemann, Stenhouse, and Scholastic are the foundation of my work. I’ve tested the lessons in elementary, middle and high school and always with success. In addition, my own comprehension has improved dramatically by learning these strategies, which I had not learned in school. About 20 years ago, teachers started using leveled texts to teach reading (Clay, 1991) and continue doing so today. In grades K-2 there are approximately 32 levels according to Reading Recovery (Ohio State). Basically, students begin reading early-level books and learn concepts like 1-to-1 correspondence between a word on a page and the spoken word. Younger children learn to read from left to right. When they get to the end of a line, they move their eyes to the next line and start at the left again. These are some of the concepts of print taught in grades K-2. Students move through 20 levels in K and 2nd grade according to Fountas & Pinnell. In each level, students learn more characteristics of text. But as students move into third grade, it gets more and more difficult to say with certainty at what level a child is reading. In the upper grades we measure one year’s growth instead of small, incremental levels like in the lower grades. We use gradations like lexiles and Flesch Kinkaid scales. Unfortunately, the scales we use analyze only 2 factors: length of sentence and difficulty of vocabulary. These systems cannot measure many factors that determine whether a child can read a book: interest, appropriate content, the level of picture support, or the background knowledge a child brings to the text, for example. It’s important to remember that these other factors WILL affect WHAT students can and will read. Under the Common Core initiative, teachers are reminded not to stop at a specific level but to choose instructional books where students can both call words and comprehend. The authors of Common Core do not state specific percentages for determining instructional levels as explained below in Goldilocks. Teachers are taught to consider range, quality and complexity when selecting appropriate reading materials for students. That said, using lexiles is one indication of reading level. It’s important to know what reading level at which a child reads. Let me explain why this way: Think of a third grader who is reading at a third-grade level. She reads third-grade texts. She flexes her reading muscles every single day trying to figure out up to 10% of the words that are unfamiliar to her. Now, think of a third grader who reads on a 5th-grade level. She also reads third-grade texts as a steady diet. She rarely flexes her reading muscles because the texts are too easy for her. Finally, think of a third grader who reads at a first-grade level. She is given the same books as her two friends in this story. She finds third-grade texts to be challenging and misses as many as 50% or more of the words consistently. As a matter of fact, she finds reading so difficult she often gives up. Therefore, if a child reads 98-100% of the words correctly AND understands the text, we consider that an independent reading level. 90-98% is considered an instructional level – a good place for students to try out and practice the strategies shared on this site. Finally, if a child misses more than 10% of the words AND does not understand what she reads, we consider that a challenging text. The student who is reading at an instructional level with the help of a teacher should easily make a year’s growth. So, we should not think of students in terms of what grade they’re in. As you can see from my example, it’s important to think of each child in terms of what reading level they mastered. Only then can we make sure each child is “working out” every day and we are giving everyone an equal chance to build reading muscles. Therefore, for a complete workout, students read 3 levels of books every day - easy, challenging (hard), and just-right. In doing so, they improve all areas of reading ability: fluency, vocabulary, phonics and comprehension. Easy Books: Readers read easy books for the love of it. Kids choose books 1-2 years below their instructional level to read as easy books. From reading these books, students learn to read automatically and expressively. They improve their fluency, accuracy, and love of reading. Some comic books, books they've read before, picture books, and books where students can pronounce 99-100% of the words fit into this category. Think about your reading choices. A John Grisham novel measures around a 6th-grade reading level and War and Peace levels at a high school reading level. My guess is that you take the Grisham novel to the beach. Yet, War and Peace is most likely your instructional level. You didn't choose an easy book to improve your reading strategies. You select these books to have fun reading. Hard Books: Students can learn to read challenging texts daily. That reading level will be different for each student, too. A challenging book is considered one that is 1-2 years above a reader's instructional level. Another measure is finding a book a child is interested in but can pronounce less than 90% of the words. It might be a book someone reads aloud to the student or a hobby book where the child browses captions and pictures. It might be a textbook or a newspaper. From challenging texts, students learn vocabulary and text structures. From reading or scanning that next-level book, children envision what is possible. Students will read hard books if they’re interested. Case in point: third graders carry around Harry Potter books which level between 8th-10th grade reading levels depending on the book. Just-Right Books: Just-right books are considered books that are on a child's instructional reading level. As a rule of thumb, we teach student to turn to the middle of a chapter book and read one page. If he misses about 5 words, that is probably a just-right book. That is, the book is one where a student can pronounce and understand 90% of the words. While we have no perfect measure to match children to books, we know from Marie Clay (An Observation Survey of Early Literacy) that when students are able to read 90% of the words in a book, that is a good-fit book for students to get a reading workout. By using their strategies to figure out that 10% of the text - the words they don't know - students will build their reading muscles. If they workout regularly, they will grow as readers. It's important to note that no book should be off limits unless a parent feels the content is inappropriate. We want to teach students HOW to choose books to read in order to reach the ultimate goal: molding children who love to read for a lifetime. Here is a full plan for working toward a proficient-reader classroom. Show this GoAnimate video to students as an introduction to reading 3 levels of reading every day. Watch the video to learn or revisit the keys of an effective read aloud. Here is a free lesson template and explanation of shared reading's importance to balanced literacy. ReadWriteThink provides sample questions, sample response log entries, and portfolio form to run an effective independent reading time. If you are a member of ASCD, this article gives tips for helping students read challenging texts. Try some new ideas to pull students' attention back to you.